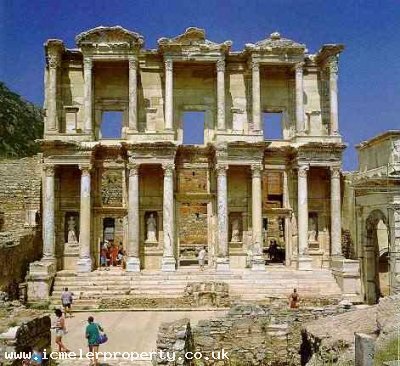 Ephesus is an ancient city which is within the borders of Selçuk. It is located on the roots of Mount Panayer and Mount Bülbül 3 km west of Selçuk. It is one of the best protected ancient cities of western Asia. It became an important tourism center because it is a holy place to visit for christians. Most of the existing buildings were built during the Roman period. In the first year of Christianity, St. Paul (Paulus) came here and stayed for 3,5 years and St. John (Hojanna) came and wrote the Bible here. Ephesus was the most famous city in Western Anatolia in the Ionian period because the Virgin Mary lived here in her last years. The bible was written here, council meetings were held and the first 7 churches were established here. Ephesus is the second city after İstanbul which is visited most by tourists. Ephesus moved five times because of political and geographical difficults. The city was under Ionian authority in the XI. century BC and under Ottoman authority after 1390. The Greeks occupaid the city on 22. May 1919 but it was burned on 8. September 1922.